Donald Trump combines his passion for golf with a desire to build world class courses. (CNN) -- American billionaire tycoon Donald Trump could never be accused of underselling himself and his myriad of business projects so it came as no surprise when he said wanted to build the "world's best golf course" in Scotland. Trump is visiting the site at Menie, just north of Aberdeen, where he has been given permission to start the ambitious development, and CNN's Living Golf has been granted exclusive access. 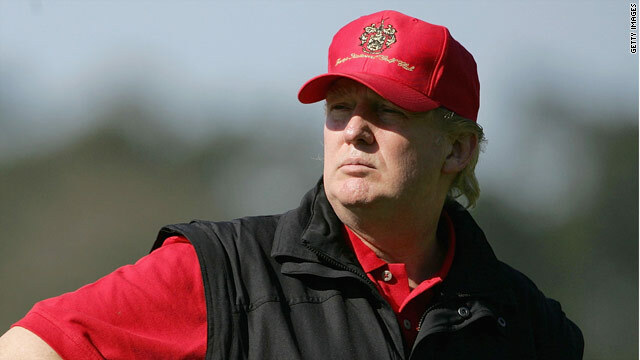 Love him our loath him, Trump is certainly a man who courts strong opinions and now you can get the chance to put your questions about this project and other golf-related matters. It's a simple process, just add your question to the bottom of this page. You may want to ask him about his love of the sport, he describes himself as an "avid golfer" and on why he believes his signature course, one of two planned for the project, can one day host the British Open. The plans have also met with considerable local opposition and it needed a decision by the Scottish Government to give it the go-ahead, so does Trump believe he can eventually win over residents and allay the fears of environmentalists who want to preserve nearby ancient sand dunes at the seaside location ? Trump's golf course portfolio currently boasts 10 courses, 11 if his Aberdeen project comes to fruition. But across the world, other similar developments have run into trouble due to the worldwide recession and the move away from traditional golf course membership. In these times of financial uncertainty, are they good investments and will all flourish ? Trump, who is a regular competitor in prestigious Pro-Am tournaments on the PGA Tour, has rubbed shoulders with the golfing elite, so who in his opinion is the best player in the world at the moment ? The 63-year-old has also been a tournament host to a top event on the LPGA circuit. Does he believe the women's golf circuit will continue to flourish after the retirement of Annika Sorenstam and more recently Lorena Ochoa ? And what really makes him tick and does he still have the same hunger to succeed as when he started out in business over 40 years ago ? CNN's question and answer session with Trump will take place on Thursday May 27. We will do our best to put as many of your questions as possible to him and publish his replies.